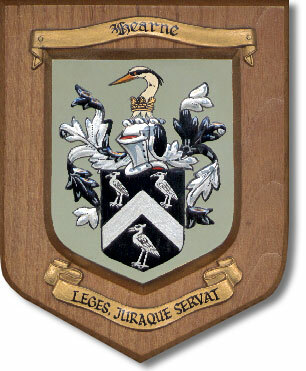 The coat of arms at left is a plaque obtained by our family in 1967 from York Insignia Ltd., York, England. On the back is inscribed the following explanation: Arms--Sable (black), a chevron between 3 silver herons; Crest--a heron's head & throat ornamented with a ducal coronet; Motto--"Leges Juraque Servat" (He maintains the laws and his rights); Heron--symbol of courage and devotion. Armorial bearings were originally designs embroidered on the surcoats worn over a knight's armor, or painted directly onto the armor or his shield. Thus the term "coat of arms" describes a device originally used as a large "ID tag", to help identify otherwise indistinguishable armor-covered knights on the battlefield. Away from the battlefield, they served to indicate blood relationships and to authenticate documents in an age when many could not read or write, and when those who did were hampered by non-standard spellings. (See "Hearn Surname", for examples of variations within a fairly straightforward family name.) The complex system known as heraldry developed between the eleventh and 15th centuries to control and bring order to the selection and arrangement of colors and symbols identifying different families*. Sir William Heron (a "gallant soldier and eminent diplomatist" summoned to Parliament in 1393) bore arms: Gules, a chevron between three herons argent. The precise heraldic language tells us that Sir William's coat of arms consisted of a red shield with a chevron positioned between three silver-colored herons. About two centuries later, an identical coat of arms was reported for Sir Nicholas Hearon, knighted in 1566. This time, the description included the motto "Leges juraque servat". It turns out, though, that "leges juraque servat" was a key part of a once well-known quotation from the Roman poet Horace. (So well-known, in fact , that in the eighteenth century Henry Fielding put the quotation, in untranslated Latin, into the mouth of one of the characters in his Tom Jones, the History of a Foundling.) "Who is the good man? (Vir bonus est quis? )", asks Horace, discussing the attributes of a good statesman. The answer: a string of "the man who..." phrases, including "qui leges juraque servat." C. N. Elvin, in his 1860 Hand-book of Mottoes translates the motto as "He observes the laws and statutes", and cites the reference from Horace. Both our 1967 plaque and the coat of arms described by Rev. Ryland have "sable", or black, shields, instead of red. So far, I have not learned the significance of the color difference. At right is a version of the Hearne coat of arms from an old monument at Hackney Church in England, as shown in Wm. T. Hearne's book, page 24. *Strictly speaking, an English coat of arms does not belong to everyone with the same surname, but only to individuals who can show direct descent through the male line from the original bearer. See the Heraldry Links for more information.